Has cold weather got your hound down? 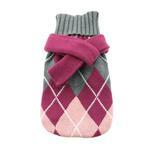 With this classy Argyle Purple Dog Sweater with Scarf, your pooch will be pretty, preppy and positive! But this is no starchy, scratchy affair. Made with 100% cotton, this sweater is soft and dreamy in a soft palate of pastels to soften the most biting weather. Ribbed armholes and hem help block out cold too. The ribbed neck can also be worn up for additional warmth. Should your dog desire extra protection from the elements, the optional scarf provides insulation around the tender neck areas. Cleverly designed, the scarf features a loop so you don't have to fuss with a knot and won't run the risk of choking your pet. Since all dogs need to be warm in winter, Doggie Design expanded their size range to fit tiny and large breeds. Sizes range from XXS through 3XL fits dogs approximately in the range of 1 to 100 pounds! Argyle Purple Dog Sweater with Scarf by Doggie Design Customer Photos - Send us your photo! It’s very cold here in Virginia right now, but Miss Lola will stay toasty and warm in her Argyle Purple Dog Sweater with scarf by Doggie Design! Such beautiful colors and the fit is perfect. And the scarf is a nice trendy touch. Looks great and we love it! Thanks BaxterBoo for once again giving your customers just what we want, just when we need it! Zena is our sweet baby girl that we rescued and we absolutely love her! She is a Chihuahua, Jack Russell and Pekingese mix! She loves her cozy sweater to keep her warm being she’s only 8 lbs! ?? Amber Rose is a very sweet 13 year old who loves to dress up and go on walks. Maddie is a Yorker-Pom mix she is the sweetest thing in the world and we love this sweater. Magi Mae enjoys her sweaters when the weather is cool. Westie rescue and only wears Baxter Boo fashions! Penny Lane is modeling the latest Fall fashion. Looking good, Penny! Posted On 11/21/17 by Mary from Pittsburgh , PA Yes, Mary recommends this product! For several years, I have been searching for sweaters that fit my standard schnauzers, are made well and double thickness knit for warmth when the yarn stretches. I recently discovered Doggie Design sweaters and Baxter Boo. To keep my dogs warm and dry, I have purchased 12 Doggie Design sweaters from Baxter Boo. The argyle sweaters were delivered today and the quality and appearance are even better than I expected. Thank you Baxter Boo for carrying such wonderful and practical products. Thanks to your sales and incentives, my dogs will be warm and dry and dressed very attractively! Wonderfully warm sweater and scarf. Beautifully made...bring on the cold! Very nice sweater. It fits well. I ordered a med for my 14lb baby. It's soft. I love that Baxter Boo only sells quality merchandise. The scarf is separate and I actually don't care to much for it and will not be using. Posted On 10/31/17 by Ellen S from Greenwood, IN Yes, Ellen S recommends this product! 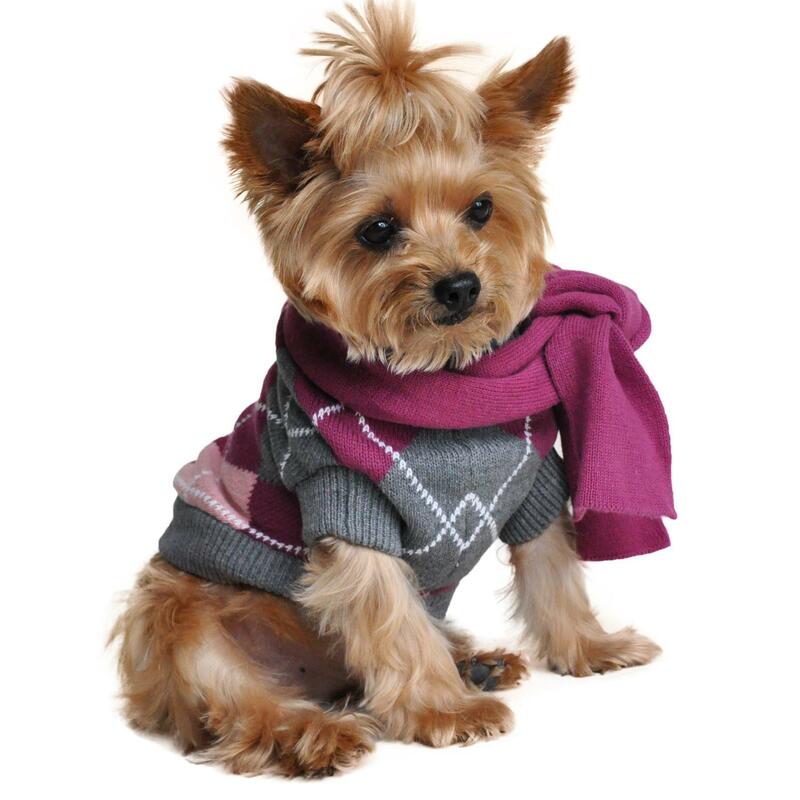 The sweater with scarf set is very warm and looks very attractive on my male dog. Posted On 10/28/17 by Joy M from Oakland, CA Yes, Joy M recommends this product! Arrived quickly and is so adorable and seems to be of good quality, as other reviewers have stated. This was my first purchase from Baxter Boo, and I will definitely buy from them again, as well as recommend them to friends! Posted On 10/22/17 by Marianne K from Warwick, RI Yes, Marianne K recommends this product! I bought this sweater for all 3 of my fur babies. Best made sweaters I’ve seen in a long time. The scarf is a gorgeous touch. Celebrate Spring in this peppy argyle sweater! Posted On 03/07/17 by Mary Lou E from Dunmore, PA Yes, Mary Lou E recommends this product! Just gotta love this sweater/scarf combo! I have to admit, I ordered this in a size too large. However, my sweet fur baby won't let me take it off her, so I can't return it for a smaller size. I have a cashmere sweater in the exact lavender shade, so we look pretty special together in our new Spring outfits. Only wish mine came with the scarf, too. I've ordered from BAXTERBOO every month since I rescued my 2 lb. Chiweenie and I've always been thrilled with the quality of the items and the exemplary customer service! Posted On 02/13/17 by Cindy S from Racine, WI Yes, Cindy S recommends this product! Posted On 12/27/16 by Cheryl C from SPFLD, MA Yes, Cheryl C recommends this product! Posted On 12/20/16 by Joanne B from Cupertino, CA Yes, Joanne B recommends this product! I bought this sweater for my little chihuahua and it's just adorable! the scarf is cute but doesn't really stay on. For some reason the sweater slides down and eventually slips off, but it's cute while it's on. maybe it's just not the right size for my pup. Posted On 12/17/16 by Linda Y from Garden Grove, CA Yes, Linda Y recommends this product! Really cute. My dogs love the sweaters in this winter weather. Posted On 12/07/16 by Angela B from trenton , OH Yes, Angela B recommends this product! Posted On 11/10/16 by Kristine R from Roswell, GA Yes, Kristine R recommends this product! This sweater is super cute! It hugs my Zoey just perfectly to keep her warm. The scarf is very cute as well. This is a quality sweater! Posted On 10/30/16 by gina from , OH Yes, gina recommends this product! Posted On 07/09/16 by Onesa B from Brooklyn, NY Yes, Onesa B recommends this product! Very warm and I love that it includes a scarf. Love this sweater & scarf! One of the cutest sweaters with matching scarf that I have ever seen! Posted On 05/06/16 by Lindsey H from Calvert City, KY Yes, Lindsey H recommends this product! This cozy little sweater was perfect for my 1 lb chi. It wasn't bulky and the fit was perfect. Adorable sweater with an additional scarf included. Will keep your pet warm of a cool day. Posted On 03/18/16 by Jane D from El Cajon, CA Yes, Jane D recommends this product! Very well made. The scarf was a great added bonus. Posted On 03/16/16 by Peggy S from , KY Yes, Peggy S recommends this product! Magi looks so cute in her new sweater and scarf. It fits well and is perfect for cool weather. Posted On 03/12/16 by PAT from SLOAN, NY Yes, PAT recommends this product! This is one of 4 items I purchased for my grandpup. My daughter loved the sweater for her dog in the cool spring weather. Great gift! Posted On 03/12/16 by Shirley J Ziobron from Elkton, MD Yes, Shirley J Ziobron recommends this product! Our Molly looks adorable in her sweater and matching scarf. Fits nicely! Posted On 03/12/16 by rebecca w from Hartford , VT Yes, rebecca w recommends this product! Looks great on my 5 pound chichuhua. I bought a size small, perfect fit and we'll made. Posted On 03/11/16 by Sheila H from Dalton, GA Yes, Sheila H recommends this product! Posted On 01/26/16 by Alana B from York, PA Yes, Alana B recommends this product! Liked item but 1st one was too small and second one was way to big. Need something in between. But love the sweater. Posted On 01/18/16 by nancy d from Fleetwood, NY Yes, nancy d recommends this product! I love it. The color (lavender/gray) is lovely. The size (small) for my 9 pound Yorkie mix is perfect. Posted On 01/06/16 by Linda S from Murfreesboro, TN Yes, Linda S recommends this product! This was a gift to my Son's yorkshire terrier for Christmas. He said it fits her perfectly and she loves all of her gifts from BaxterBoo! This is a terrific quality, thick sweater that fits my dog perfectly! She looks like she belongs in an ivy league school! Ha ha Seriously, it's perfect for her, especially with the uber-cold weather we're having! My Little Boo Boo enjoys wearing his beautiful sweater! The quality is of top notch. I only buy clothes from Baxter Boo. Posted On 10/28/15 by Amy M from Edgewater , MD Yes, Amy M recommends this product! Perfect for the party girl! I love that BaxterBoo gives measurements that are spot on! Posted On 10/14/15 by Audree D P from , CT Yes, Audree D P recommends this product! Item arrived FAST! Great job! I ordered a size larger for extra measure because she has to put her head through, and it fits perfect and is so easy to get on and off! Love the colors, quality, softness and warm weight. I always thought there should be scarves for the pets, so the matching, unattached scarf is a real perk to keep her neck protected when the snow begins to blow! Posted On 09/16/15 by Tracy B from Cleveland, OH Yes, Tracy B recommends this product! Easy shopping with help from pop up answering questions and helping to pick a size. quality products as far as i can tell. also liked that all info was displayed on checking out to make sure i didnt make mistakes. very good check out system.